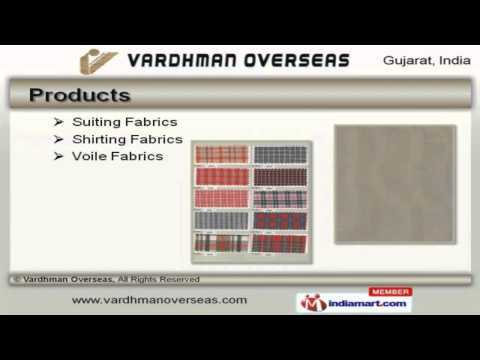 Welcome to Vardhman Overseas, Manufacturer and Supplier of Suiting and Shirting Fabrics. The company was established in 2010, at Rajkot. Our Sound financial position and Vast distribution network help us to achieve an enviable position in the industry. Maximum client satisfaction, Timely delivery of products and Crystal clear business transaction dealings make us the first choice of our clients. We are able to offer a exclusive range of Suiting, Shirting and Voile Fabrics. Our Mens Jeans and Trousers are reckoned all over the world for their superb quality. Mens T Shirts and Ladies Jeans offered by us are available at industry leading prices. Our Mens T Shirts and Ladies Jeans are very stylish and elegant. We also provide Printed Fabrics that are best in the industry amongst others. Along with that we offer Linen Fabric for Bedding that are extremely reliable.